On July 31, the teachers’ attorney, Mark Schwartz, filed his response. Prosaically titled, “PLAINTIFFS’ MEMORANDUM OF LAW IN OPPOSITION TO DEFENDANTS’ MOTION TO DISMISS COMPLAINT,” it asserted that to the contrary, the teachers’ complaint did state valid claims, further that pursuing it would not require any impermissible meddling in religious doctrines, and that the motion to dismiss should be denied and the case be moved to its next phase, which is discovery of documents and other background, in preparation for a trial. I’m advised that the court could take months to act on the motion to dismiss; so those who are following the case should not hold their breath. Nevertheless, to update our coverage, here are some key excerpts from the plaintiffs’ July 31 memo. “At first blush, this matter deals simply with a motion to dismiss a civil rights case with pendent claims as Defendants claim protection under the Establishment Clause of the First Amendment to the U.S Constitution. However, the attack amounts to something much more, something dangerously precedent-setting were it to be approved, namely that a private school and those affiliated with it are exempt from the reach of Federal and State Civil Rights Acts. This is all despite Friends Central’s professed adherence to notions of responsibility, equality and diversity. When the rubber meets the road, these Defendants are insisting that they are untouchable and above it all. 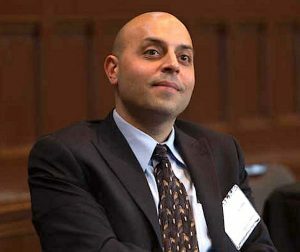 Sa’ed Atshan, Swarthmore College Peace & Conflict Studies Assistant Professor. He was approved to speak, then the invitation was abruptly quashed. However, Defendants fail any applicable test. 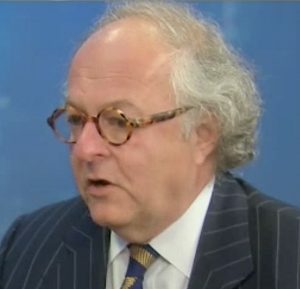 In no way do Plaintiffs’ claims require inquiry into religious tenets of Quakerism. Plaintiffs do not make any claims or counts based therein. 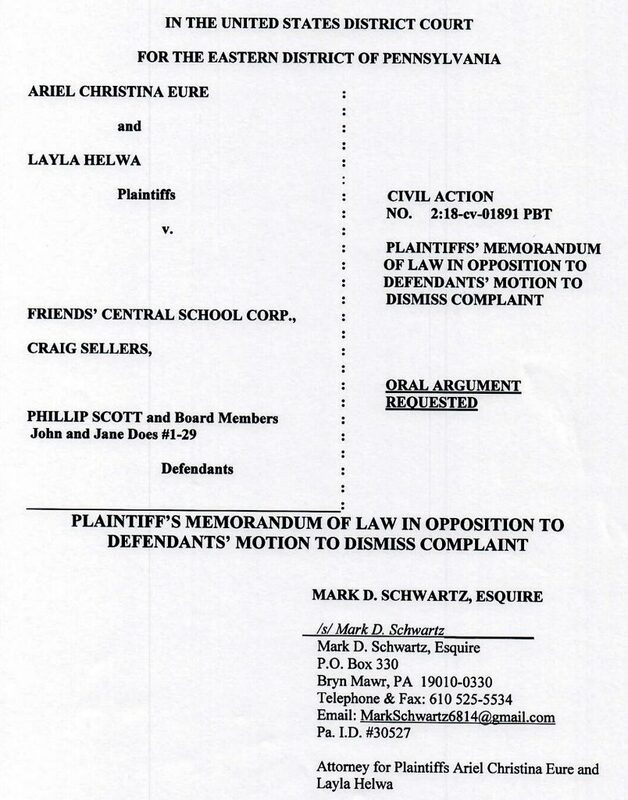 Rather, Plaintiffs Complaint references guidelines and policies set forth by the school so as to depict the environment in which Plaintiffs worked and to justify their adherence to those guidelines and policies. . . .
Former Friends Central teacher Layla Helwa. suspended, then fired. Should this Court accept Defendants’ arguments, then there is nothing to keep any purportedly religious school from claiming immunity from the Civil Rights laws, or any other laws for that matter, taking us back to the dark ages in American jurisprudence. . . . Defendants cherry pick portions of the Complaint, then editorialize and mischaracterize it. Defendants impermissibly argue facts. 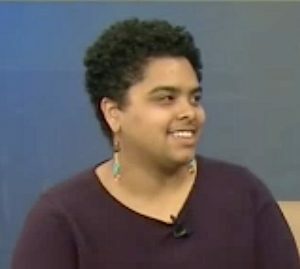 For example, despite the Complaint’s clear words, Defendants claim that Plaintiffs ‘refused to heed their supervisors.’ The Complaint, is devoid of such assertions or admissions. . . .
Ariel Eure, former Friends Central teacher. Suspended, then fired. 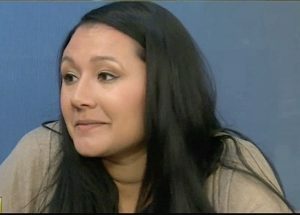 Defendants’ claims are simply astounding; i.e., that ‘Plaintiffs set forth no facts reflecting a hostile work environment, merely repeating that they were disciplined for their failure to comply with their supervisors’ directives regarding reactions to and measures for discussion of the proposed outside speaker.’ This merely reflects their alternate statement of facts and their deliberately ignoring what Plaintiffs have clearly set forth as a “hostile” environment. . . .
“. . . the Complaint . . . refers to basic Quaker tenets as espoused by a purportedly Quaker-related institution.” But, he insists, “Doing so does not require the Court to interpret questions of Quaker scripture, doctrine, or canon. There is no mystery here. 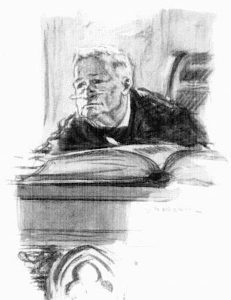 There are no Quaker hierarchy issues or sect competitions characteristic of Establishment Clause cases. Rather the Complaint sought simply to depict the nature of the environment espoused and Plaintiffs’ adherence to those simple tenets. Friends Central Head of School, Craig Sellers. 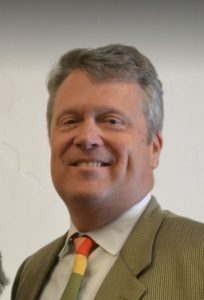 Schwartz tracks methodically through page after page of additional case citations, finding most irrelevant (or “inapposite”), and more than a few in fact supportive of his clients rather than the school. We won’t follow him through all these, as many involve legal points well beyond my pay grade. 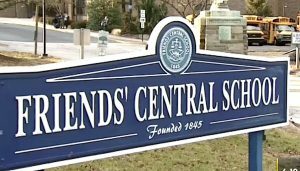 ‘When Friends’ Central School was founded in 1845, it was a time of great division among Quakers. Our school was founded to include and serve all Quakers and was, by design, co-educational and open to non-Friends’ from the day it opened. This interest in inclusivity continues today as Friends’ Central strives for racial, religious and socio­- economic diversity in its student body and among its faculty. It may be months before we learn whether Schwartz and the teachers will fend off a dismissal and get the chance to pursue their case further. Stay tuned. Am I missing something here? Let’s take Quaker out of this. Two employees planned something that their boss overturned. The students did not like it and they protested. The teachers walked out with them. They were viewed as enabling if not encouraging dissent. These are non-unionized, at-will employees. Their boss right there can fire them, legally unless there is a contractual process. Seems to me these teachers may have done the right thing, but don’t like the consequences of it. I don’t blame them. But a law suit? Really? Sounds quite out of keeping with Friends process. Lawsuit should be the last resort for Friends. Are any of these people Quaker anyway? Who’s under the illusion that Quaker schools are remotely Serving the Society anymore? Kevin, their lawsuit alleges that these adverse employment actions involved various forms of discrimination that are illegal, whether they are “at will” employees or not. Will their claims hold up in court? That’s what we’re going to find out. As per usual, Chuck has it right . Hope you’ll keep us posted on what happens with this case. I’ll do my best, Anne . . .